We spent two days at the Livingston RV Park in Livingston, MT, then moved on to the Jellystone RV Park in Missoula, MT. We did not see Yogi or Boo Boo on arrival, but I am sure they were lurking in the nearby woods. The trip was northwest on I-90 for about 230 miles through Bozeman and Butte. We got up at 6:30 am to hit the road. I am sure the early hour was Kathi’s idea, since I gave up early rising upon retirement. It was nice and cool when we started the trip and it got progressively hotter during the day. We loved the scenery, especially the mountain streams that run alongside the highway. Jellystone charged us $180 for a week and we could not get cell phone service in our motorhome, both items were real downers. Kathi had to go outside and walk about 25 yards from the left front of our motorhome to pick up a cell phone signal. Everything else in the park was great. Jellystone was a well-kept and well-manicured facility and the mountain views around the park were great. We arrived so early in the day, we had time for a little exploring in the afternoon. 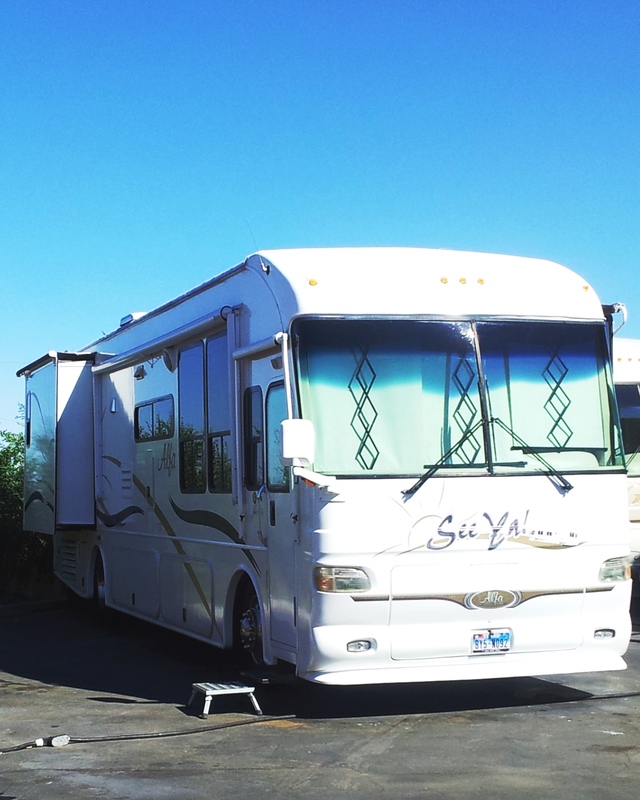 We went to Bretz RV and looked at the newer model Alfa motorhomes. We found them too expensive and a trade for our 2003 Alfa See Ya’ was not feasible at that time. While we were at Bretz, we checked to see when we could get into their shop for some minor repairs. They gave us a shop date for July 24th. We spotted four other See Ya’s at Jellystone. That was unusual, since we normally do not see any. I suppose they bought them at Bretz. We spent the rest of Monday afternoon at home. Tuesday it was warmer and we got haircuts then spent the afternoon at one of the small casinos. Montana had a limit of 20 slot machines in each casino, including video poker, Keno and bingo machines. There was a limited amount of games we could play, but several small casinos to choose in the area. State law requires a minimum payback of 80%, with a maximum bet of $2 and maximum payout of $800. We found that most of the casinos have regular players that usually frequent the same machines every day. Some show up after work and if you are playing the machine they like to play, they will sit and watch you until you move, so they can play. Interesting stuff. The state is a partner in all casinos, except on Indian reservations, where they have a completely different set of rules. I broke even in the casino and Kathi lost a little, so she made me pay for dinner at Outback. We both enjoyed ribeye steaks with baked potatoes and salad. The meal was delicious as usual at Outback. Wednesday, we did out laundry in the morning and went to Cracker Barrel for lunch. We discussed the unexpected high temperature in the Montana mountains and decided after we got our RV repairs done we would head to San Francisco to see our oldest son, AJ and enjoy the cool air in the Bay Area. Thanks for the comment, Debbie. Actually this post is retro about our 2007 travels. We are still at Green Caye in Dickinson, TX and will be here until Thanksgiving. Then hopefully, I can start writing about new adventures.